Latest addition to the range of our wines is obtained from the vinification of pink grapes of Pinot Grigio. With this method the grape must not remain in contact with the skins, which would otherwise have acquired their color rust. After a soft pressing of the grapes, the grape must is fermented for 15-20 days at 16° C . After fermentation, the wine is kept at a controlled temperature of 15-16° C in stainless steel tanks until bottling. Dry white wine is straw yellow with light coppery hues; the aroma is clean and intense and the taste is dry and pleasant with a wide and varied bouquet, with special scents reminiscent of white flowers and ripe apple. Wine of great character and versatility. Excellent as an aperitif, ideal accompaniment to pasta dishes based on fish and shellfish, perfect with white meat or boiled fish. 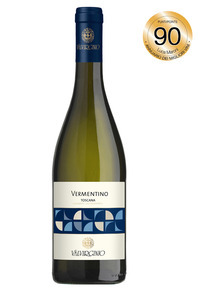 The Tuscan White “VERMENTINO” is produced exclusively from Vermentino grapes, white vine variety that is best ecultivated in hilly areas. Grapes are harvested entirely by hand at the right stage of ripeness, they are crushed and left to ferment in low temperatures resulting in a white wine with character. The the nose it’s fruity, with interesting aromatic notes of yellow peach. The taste is pleasantly dry and mineral, with excellent structure and great softness. With its characteristics it’s ideal to accompany fish soups, grilled fish and seafood. Excellent as an aperitif, it goes very well with vegetable pasta dishes .